This collection consists of 24 black-and-white photographs of captive passenger pigeons taken by J.G. Hubbard in Chicago in 1896. The pigeons were part of the collection belonging to Frank M. Chapman, former curator of ornithology at the American Museum of Natural History in New York. 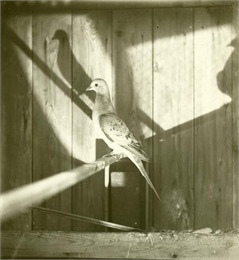 The majority of the photographs were taken inside of a coop. 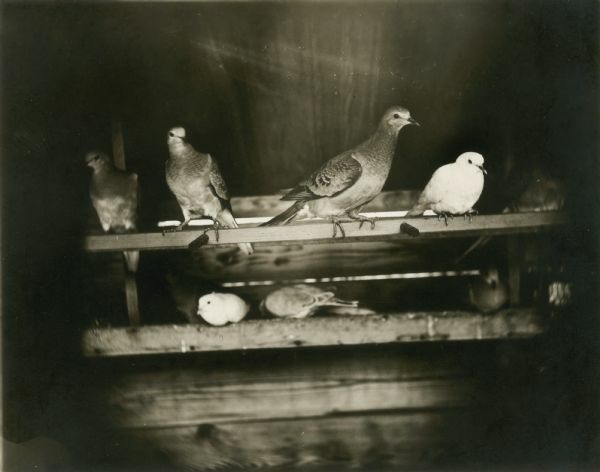 The photographs show pigeons as chicks and adults, singly and in groups. At the time the Europeans began exploring North America, ornithologists and historians estimate that there were 3 to 5 billion passenger pigeons, constituting 25 to 40 percent of the total North American bird population. Each spring they migrated from the South to the Midwest, making a return journey in the fall, darkening the sky with their passing. A combination of their nesting habits, over hunting, and the clear cutting of forests caused their extinction. The last passenger pigeon, a captive bird named Martha, died at the Cincinnati Zoological Garden on September 1, 1914. The male bird was approximately 16 inches in length, the head and back were bluish-gray, the neck bronze and green, the breast russet or wine red. The females were similar but duller and paler in color. The irises of both were bright red. The mourning dove is the closest relative of the passenger pigeon and resembles it in shape and coloring, often causing mistaken identification long after the passenger pigeon was extinct. Passenger pigeons would fly and nest en masse. John James Audubon recorded a flock that passed overhead continuously for three entire days, and upon finding their roost he found the ground covered in two inches of bird droppings. The largest recorded nesting was in Wisconsin in 1871. A conservative estimate of the nesting area is 850 square miles, and estimates put the number of nesting pigeons at 136 million. With as many as 100 nests in a tree, the weight sometimes caused branches to fall off and trees to collapse. Traveling in huge numbers protected the pigeons from their natural enemies by sheer numbers, as only a small percentage of their flock would be killed. Passenger Pigeons required dense forests for food, eating acorns and beechnuts. Male pigeons fed twice a day, morning and late afternoon, and the female pigeons fed in between. The pigeons only laid one egg a year, and the young (squabs) were helpless for the first two weeks of life, tieing the parents to the nest for 30 days. When the squabs were old enough to feed themselves the flock moved on, leaving the squabs behind. In the late 19th century professional pigeon hunters followed flocks around the country using the new railroads, searching for nesting grounds. They used several techniques to kill the pigeons, netting them as they left or returned to their roost being the most common. One throw of the net cauld catch more than a hundred birds. If the parents were killed, the abandoned squabs would also die. After the parents moved on from the roost, hunters would enter the nesting ground and pluck the fat squabs out of the nest, as they were considered a delicacy. Hunters put their bounty in barrels and shipped them east. New York City could absorb 100 barrels of pigeons a day, each barrel holding 500 to 600 hundred birds. Hunting of passenger pigeons decreased their numbers, especially since they laid only one egg a year. However, it is widely accepted that the deforestation of the land played a leading role in their extinction. Passenger pigeons required large tracts of unbroken forest to support their flocks, colonies of even 5,000 birds could not survive. A boy in Ohio killed the last wild passenger pigeon in 1900 with BB gun. Hefty rewards for a confirmed passenger pigeon sighting went unclaimed. 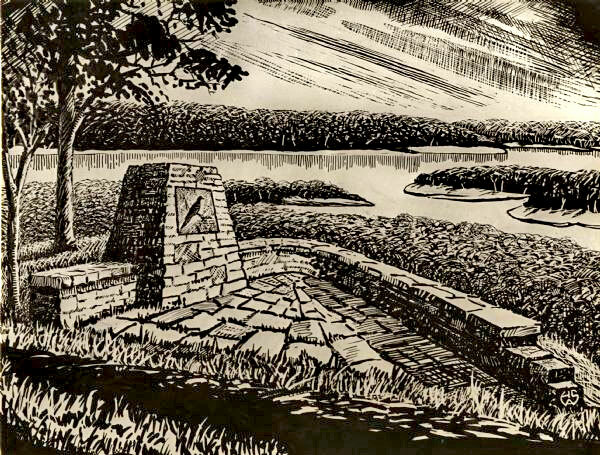 In 1947 Aldo Leopold spoke at the dedication of a monument to the last passenger pigeon in Wisconsin, erected at Wyalusing State Park.